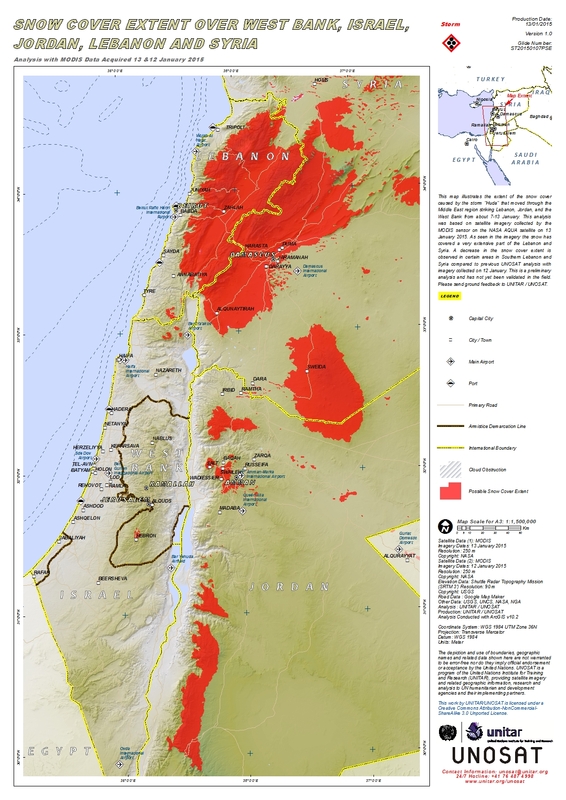 This map illustrates the extent of the snow cover caused by the storm "Huda" that moved through the Middle East region striking Lebanon, Jordan, and the West Bank from about 7-13 January. This analysis was based on satellite imagery collected by the MODIS sensor on the NASA AQUA satellite on 13 January 2015. As seen in the imagery the snow has covered a very extensive part of the Lebanon and Syria. A decrease in the snow cover extent is observed in certain areas in Southern Lebanon and Syria compared to previous UNOSAT analysis with imagery collected on 12 January. This is a preliminary analysis and has not yet been validated in the field. Please send ground feedback to UNITAR / UNOSAT.